As artists, we are expected to pour ourselves into our art so that we can elevate it to something more. So how do we separate ourselves from that work when receiving feedback or critique from others, or in this case, when facing possible rejection? Right now, some of you might still be mulling over the latest DFA results and wondering why you placed where you did or why your work did not make it to the final live judging round. I can commiserate because I, too, have been there many times. As artists, we are expected to pour ourselves into our art so that we can elevate it to something more. So how do we separate ourselves from that work when receiving feedback or critique from others, or in this case, when facing possible rejection? By donning some extra layers of skin and accepting this as a learning opportunity. This is why DFA has made it a priority for this competition to also be a resource for learning. No matter where you are with your work, there is always something to take away from watching the live judging broadcast. Don’t focus on just your photo(s), take notes from the comments about others as well. 1st Place: Birth by Matt Writtle, United Kingdom. I was so happy to see many photos from all over the world and was eager to learn about family life and experiences beyond my own small bubble – so more of that please! It was a heck of a job trying to narrow down each category to a short list and that difficulty is a testament to how good these submissions are. Over the last few years, I have seen the standard of documentary family photos be elevated and it is because of the work this global community has put into it. However, this also means it will be harder to rank at the top of the categories. Not only does your photo have to reflect solid technical choices, it has to represent your unique Point of View. Even with a documentary approach, where nothing has been prompted or staged in the physical picture-taking process, there is still the risk that photos can start to look similar and pedestrian if we don’t make an effort to put our unique stamp on it. That is the incredible thing about documentary photography: at the intersection of the unexpected (we don’t know exactly what will happen) and your point of view (how you see the world), lies the potential to create something special, something great, that will make someone feel something (yes, I’m echoing what Ryan Christopher Jones has already touched on because it is so on point!). 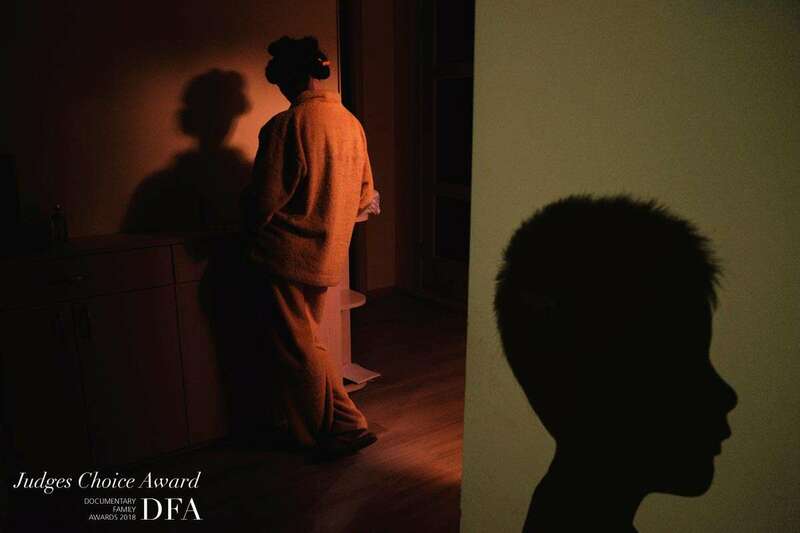 As subjective and different as all of us judges are, this is always what we look for and is what the winning photographs of the DFA have in common. The uniqueness of the photographer’s point of view is what helped me with my final two Judges’ Choices. My appreciation for these photos is that they are quite different from how I see the world and I am drawn to them because of this reason. Kelly Koller, United States. Selected by Felicia Chang. 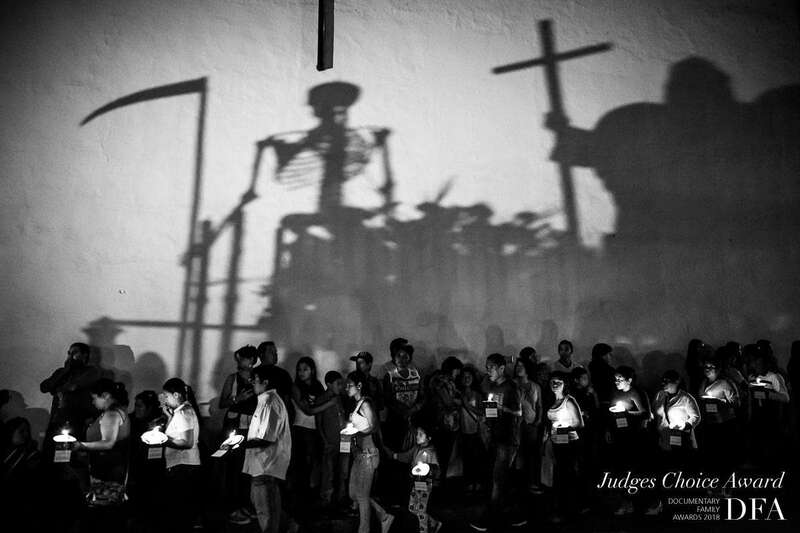 That black and white image of the shadows juxtaposed against the parade of the living is so haunting to me. The shadows go beyond providing simple graphic interest. The varying translucency of the shadow layers enhances the idea of multiple dimensions or worlds, mirroring that of the living, the dead, and possible in-betweens. It made me contemplate about religion versus spirituality and helped me appreciate that no matter the differences in cultural beliefs, they have the power to unite all kinds of people over generations. The image of the mom and the shadow of the little boy represents mystery of a different kind. The reality may well be much simpler, but the photographer’s use of an abstract frame and recognition of different light has created a photo that raised many questions for me. Who are these people? Are they related and if so, how? Tension is created through the use of light and the expression of form. The juxtaposition of a 2D feel on the right (hard shadow on the wall) with a more 3D quality on the left (directional light to enhance the woman’s form and adds information about her environment) makes it feel surreal and a little unsettling – where is the person that goes with the boy’s shadow? The tones of colours are reminiscent of Alex Webb’s colour work, with a hint of Rebecca Webb’s poetry (particularly with their bodies facing away from each other). Ryan has touched on many good points about each category (read more here), all of which I agree with. 7th Place: Birth by Gabriella Hunt, United States. I would like to add a few thoughts about the Birth category. While you might have to work harder to find moments when photographing family life, photographing someone’s birth experience is rather the opposite. The moments are almost handed to you, so you need to find the best composition and light to support the ones you choose to photograph. 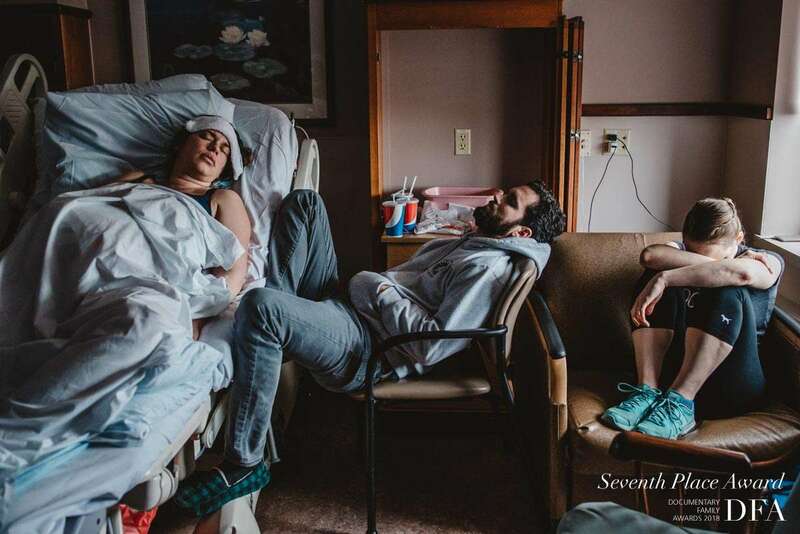 As these photos are submitted as single storytelling images, I would have liked to see more images with context that indicates that this photo is about birth. There were a lot of good photos, but where they fall short is their inability to work as standalone images. A lot of the photos were submitted in black and white, but some of the conversions were not successful as they were not toned properly or the quality of light was poor to begin with. If the conversion is mostly mid-tone heavy (a lot of grey), it makes it harder to read the image clearly and quickly. The birth experience is not a shot list of what happened, but rather how it felt for the people that were present (although this is also true for the other categories). Holding a newborn is going to be the common end result for parents. You have to find nuances that make this different, while also making it unique to them. Birth is so much more than the act of birthing or going through labour. It is about the rollercoaster of emotions women go through and the way they experience it is never the same as another. It is about documenting and celebrating women’s bodies, the difficulty in conceiving, the loss, the bridging of new life with eager parents and families through surrogacy or adoption. It is the making of a family and the redefining of an existing one. Finally, it is also about the birth space and how it transforms during this experience – this is particularly true of home births. A living room is no longer centred by a coffee table, a dining table is now a staging area for home birth supplies, a bed is now a birthing surface. Photograph details that represent evidence that birth has taken place here. Beautifying birth. Birth can be beautiful, there is no argument here. But photographing only the beautiful moments would not be a fair representation of what women tell each other when they swap birth stories. Don’t shy away from photographing moments that are emotionally difficult or visually messy, but also be careful not to photograph them for shock value or in a way that may feel exploitative. I really hope that DFA will keep bringing back this category!